Cambridge, MA - The mayor of Cambridge has proposed limiting the size of soda and sugar-sweetened beverages sold in city restaurants, saying she was inspired by a similar measure in New York City. Mayor Henrietta Davis on Monday asked the city’s health officials to research her proposal and make a recommendation on limiting beverage sizes. The city is adjacent to Boston and is home to Harvard and MIT. 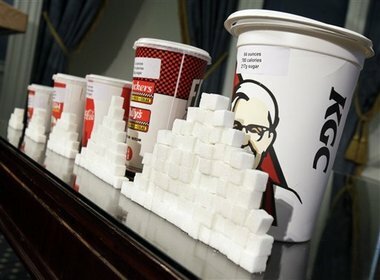 In New York, Mayor Michael Bloomberg’s proposal would prohibit licensed food service establishments in the city from using containers bigger than 16 ounces to serve high-calorie drinks like colas. Consumers could buy another round, but restaurants couldn’t serve sugary drinks in the 20-ounce cups now popular at fast food eateries. Davis, who also is a chair of a Cambridge community coalition that focuses on children’s health, said she’s been hearing mixed reactions to her resolution. He said he sells a lot of the store’s signature Big Gulps, but said it’s mostly grownups who buy them. if you sell poison, you are responsible. LEave it to the Harvard liberal intellectuals to come up with messed up policies like these. It's all there good at. Not surprising for the peoples' republic of Cambridge. That place is second to Berkeley in wackiness. I drink this poison occasionally and I'm doing just fine. You shouldn’t drink this poison because it’s caused you to be childlike and incapable of making grown-up decisions. Please forward this information to your caretaker. The mayor of Cambridge, Mass, and the city council actually have just about no power over there. They can hold press conferences, etc., but they're mostly just talk, talk, talk. Why are these creeps considered the smartest people in the world? To me they are just a bunch of mind numbed idiots. SO? Mass. is also known for Ted Kennedy and Chappaquiddick, nothing "brilliant" there! What's your point? The article stated the city is home to MIT and Harvard, it didn't say the universities did studies on the effects of 16 ounce sodas vs. 16 ounce milk shakes per se!